A UNESCO World Heritage Site full of wonderful architecture like the University of Sankore, the city of Timbuktu in the West African country of Mali has been a center of trade and learning for nearly a thousand years. Hardly an inaccessible or mythical place, the very real, not at all mythical or inaccessible city has thrived on modern tourism for decades. Sadly, the last several years have seen strife overtake the city, with jihadist rebels occupying the city for about 8 months in 2012 and 2013. Nathan takes us back to a happier time in the city, when it was the capital of the Malian Empire. Nathan adds to his collection of world architecture creations by depicting the royal palace in the Sudano-Sahelian architecture style as it might have existed during the reign of Musa the First (r. 1312–1337). Nathan has accurately captured the iconic architectural style, built from adobe or mud-brick, with supporting wood beams or logs that jut from the walls. He’s also given us a view into a scene described by a medieval Arab historian, showing the ruler on his throne holding an audience with his people. The large, raised throne is wonderfully detailed, and every group of people — soldiers, supplicants, royalty, and even musicians — has a unique look. From the people to the architecture, Nathan’s research into the material shows in his LEGO build. Excellent write-up, Andrew! It’s clear you did your research too. You have always treated my work well, and it’s nice to see that TBB now has an Africa tag. Thanks, Nathan! 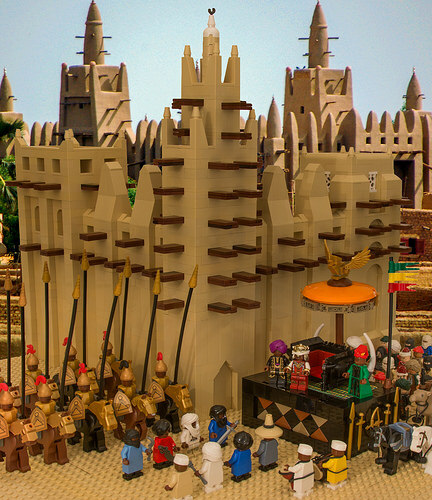 Totally agree — Africa needs more LEGO love.